No, our dog Bigsby (pronounced Bigzbee) did not pass away on July 14th. This is the day we gave him away. This is the story of Bigsby. My wife, a previous dog owner and lover, always visited Russo’s Pet Store in Fashion Island when we went there and we both played with puppies for a while. About four years ago, she calls me one day and says “Guess what….I bought a Shih-Tzu puppy.” Although I never owned a dog, I had dog owner friends and was always eager to own one. When I came home, I saw this adorable fluff ball walking around the house. My wife says “what should we call him?” I don’t know where this name came from, but my response was “He looks like a Bigsby to me.” Later on, when I Googled Bigsby, it turned out to be an electric guitar manufacturing company! Bigsby was 3 months old when we purchased him. The pet store had purchased him from a breeder. As Bigsby grew, I realized what a beautiful dog he is. He had algae-green eyes, which I have been told is rare. I think Bigsby was destined to be a show dog, if it wasn’t for his undescended right testicle, which is perhaps why the breeder decided to sell him. When he was neutered, the surgeon also removed the undescended testicle, since it had an increased risk of developing testicular cancer. The next day after we purchased him, my wife started to get cold feet. “I am too old for this; I work full-time, how I am going to take care of a puppy that is like a child.” By then, Bigsby had already won my heart, so I promised my wife I would take care of Bigsby. The first 2 months were not fun, as I had to take him out every time he cried, since we were afraid he would soil and thus mark his territory in the house. This meant in the middle of the night as well. Once he was “potty trained” and he could control his bladder and rectal tone, the real fun began. During the next three years, we had a great time with Bigsby, and he received a lot of love and attention. Things changed, un-intentionally, when our daughter Lena was born. Over the past year, the attention of my wife and the rest of the family naturally switched to her. It also didn’t help Lena has a great personality and everyone wants to spend time with her, which meant less time for Bigsby. The last year and half, I have been essentially the only care-giver to Bigsby. I used to walk him 5-6 times a week, but recently I could only take him out for a walk 1-2 times a week. The amount of time we could spend with him also decreased substantially. Still, I was confident I could make it through another couple of years, until our daughter is old enough and things would go back to normal. The news of my wife’s second pregnancy, however, really made us think about what’s best for Bigsby. Although Bigsby has gotten used to Lena, it is clear he is not his old self. Most of the time, he went upstairs and would sleep for hours. He sometimes would bark for no reason, something he never did before. We knew things would get worse when our second daughter is born. Although a difficult decision, we decided to do the logical thing: find Bigsby another home. We saw many families, some wanted Bigsby for free, which we refused. Our logic was if we give Bigsby away for free, this family will take him for granted and not take good care of him. He also was very particular and didn’t like many of his “suitors”. There were only two families which Bigsby felt comfortable with and both were current or past Shih-Tzu owners! The first family, however, wanted Bigsby for their 80 year old mother who had recently became a widow. We did not feel comfortable giving him to an 80 year old owner. 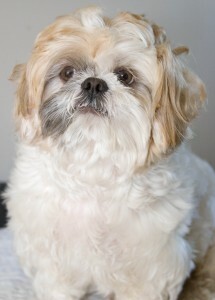 The second family had recently lost their Shih-Tzu by a hit and run driver and were looking for another one. They came to our house on July 14th, and both my family and Bigsby felt comfortable with them. It was clear Bigsby would receive a lot of love and attention. I gave all of Bigsby’ belongings to them and at last it was time to give Bigsby away. I am sure those of you who are or have been dog owners know how I felt. I started to cry; I felt both happy for him and sad we had to give him away. It has been two days since Bigsby has left us, and even though he was not a noisy dog, his lack of presence is eminent to all. Bigsby, I know you can’t read this, so I guess I am writing this blog as therapy for myself. It was a pleasure knowing you for the past four years. You brought us joy beyond description, and I am glad we were able to find you a loving family. There is a saying “All dogs go to heaven.” I am not sure if this is true for all dogs, but you, Bigsby, definitely deserve a spot there.